You can skip reading the article and choose one of our Lenormand spreads to begin a free reading session now! Marie Anne Adelaide Lenormand is considered on of the most talented professional fortune tellers – a master cartomancer and clairvoyant. Her natural talent to foretell the future and her great intelligence drove Lenormand to create an entirely new deck of cards and develop a superior method of divination. This new way of fortune telling had a completely different philosophy compared to readings with ordinary playing cards. Through it’s radically diversified card meanings it allowed all readers to look at life’s biggest questions from new perspectives and examine a querent’s life path with great precision, thus helping him or her with accurate predictions or insightful advice. Fortune telling with the new cards didn’t start until the beginning of the 18th – 19th century, but in a very short period of time it became largely popular, thanks to the fact that predictions with the new system were incredibly detailed and precise. This new form of divination quickly became useful for the most powerful and wealthy people in France – among them leaders of the French revolution and Empress Josephine herself. The professional fortune teller with more than 40 years of practice, Madame Lenormand, even regularly consulted the great Tsar Alexander I of Russia. Her salon reached tremendous recognition and most of the celebrities back then used to visit frequently and ask for her guidance. Before creating the new deck, Mademoiselle Lenormand used conventional playing cards as means for fortune telling, but soon enough found them to lack enough unique interpretations, thus rendering them insufficient for providing exact predictions. Almost nothing has been preserved of the great fortune teller’s work after her demise, but some of her methods were partially recovered from books she wrote, her student’s notes and countless follower’s stories. This led to the creation of a new original deck, consisting of 36 cards, whose images’ and concepts represent and are closely related to the world and essence of the era in which Marie Ann Lenormand lived. All of these new cards were separated into positive, neutral and negative groups, each was assigned with new, more meaningful and accurate interpretations, thus completely changing the traditional method of card reading. Each card represents either a plant, an animal, a person, an everyday object, a natural phenomena or a place. Because of these images, the newly assigned meanings are easy to understand and interpret. With each draw you are presented with an accessible and coherent hint in the form of a familiar figure, which considerably helps decipher the deeper implications of the card. Nowadays, the card divination system is based on a model of intuitive reading of the symbols the cards represent. This means that the characteristics of online fortune telling fits perfectly with this deck. The brief explanations of the cards provide the querent with means to find a desired course of action among all the possibilities and achieve a satisfying outcome. 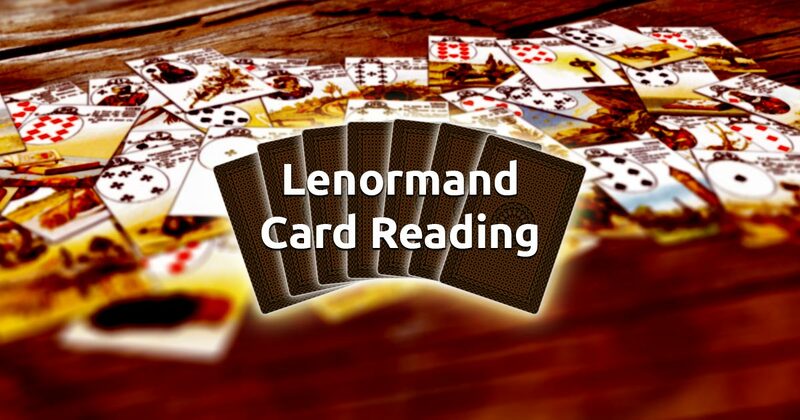 All of our Lenormand card reading spreads aim to give you directions and hints for bettering your life, and to guide your intuition into a deeper understanding of the surrounding world and your own subconscious realm.